I know it's already 2015, but I must reveal that I have only recently discovered the joy of starting your day with a huge glass of silky and refreshing smoothie. Now I cannot imagine a morning, when I don't start the blender to make this nectar of life for me and my love. Bananas and dates are a must in each of our smoothies. Dates give the sweetness (I'm not a fan of sour smoothies) and bananas give the needed creamy texture and taste. We also like to add cherries, apples, oranges, kiwis or raspberries. My favorite liquid in the smoothie is water. Plant milks are also nice, but I almost always prefer water. Adding a huge tablespoon of coconut flakes is also a great idea. 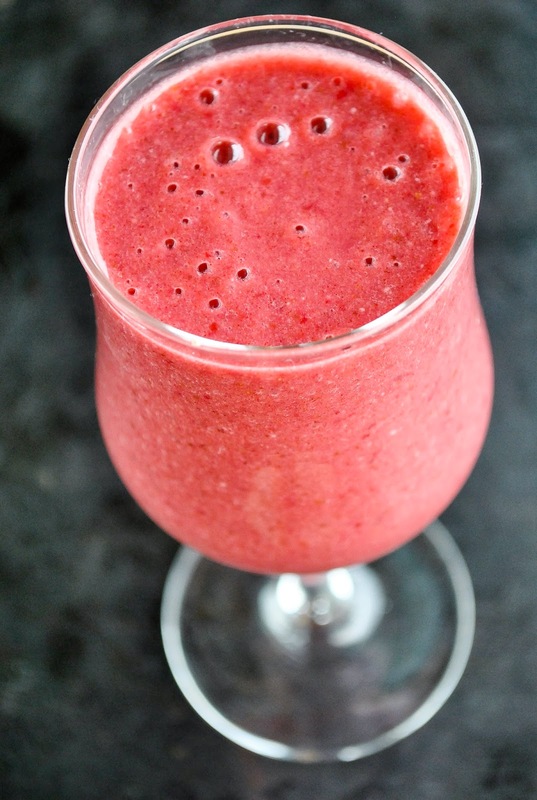 This cherry smoothie is one of my favorites. I love that you can consume a lot of fresh fruit when drinking smoothies and it's also good for your digestion and bowels. And they taste great! So when I start my morning with a refreshing smoothie and a bowl of oat or buckwheat flake porridge, I'm good to go. Pour some boiling water over the dates and let them soak for a couple of minutes. You can also soak them the night before in cold water. Peel the bananas and put them into a blender. Add cherries, cold water and drained and rinsed dates. Blend until smooth. Enjoy!